Hilmar Cheese Company is a cheese and whey products manufacturer with its main site located in Hilmar, California. The privately owned company has over 1000 employees and specializes in the mass production of Monterey jack, pepper jack, Colby, Colby-jack, flavored jacks, mozzarella, Hispanic and cheddar cheese. As of 2011, Hilmar Cheese processes two million gallons of milk per day, producing over two million pounds of cheese per day. The company's Hilmar facility produces more cheese per year from a single site than any other cheese manufacturer in the world. 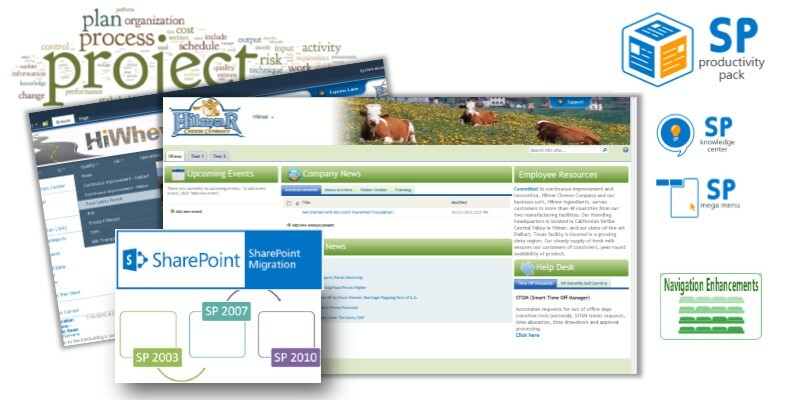 A SharePoint 2003 farm contained vital InfoPath forms for business operations. It was being called from a SharePoint 2010 farm, and some areas were surfaced within Iframes. It was a bit awkward and messy and a looming problem that needed fixing. Hilmar Cheese engaged us to perform a migration of their existing SharePoint 2003 and 2007 environments to SharePoint 2010. They also desired branding of the new site to match their current public website. Hilmar's SharePoint situation was unique in that they had a SharePoint 2003 Portal Server with vast quantities of files that were being surfaced from a SharePoint 2007 farm. Additionally, the SQL server that was the backend for their 2003 farm was highly constrained with its resources despite being maxed out with available hardware. We shipped over a loaner server equipped with Hyper-V and several virtual machines running different versions of SharePoint. From this platform, we were able to effectively import the databases, prune them, trim audit logs, find large media files that were unneeded, and purge code bits from third-party experiments. We then set up a production 2010 SharePoint farm and a development farm and did a series of test migrations until we were satisfied that the database was clean enough to proceed with a production cut over. We then set up a scripted synchronization of data between the 2003 source and the 2010 farm and turned our attention to branding to align with their corporate color scheme. The result of this migration from SharePoint Portal Server 2003 to SharePoint 2010 was a much more robust, stable, and better-performing platform, and additionally, the user interface was enhanced with tabs and several new navigational widgets that made it easier for staff to locate documents and information required to do their job. One of the easiest ways to get to know us is with a SharePoint health check, so contact us today and we can quickly review your current configuration and recommend solutions to any problems we find.